Stand up paddle boards are such a fantastic way to handle the waves out in the ocean or the light lull of the water in a river. 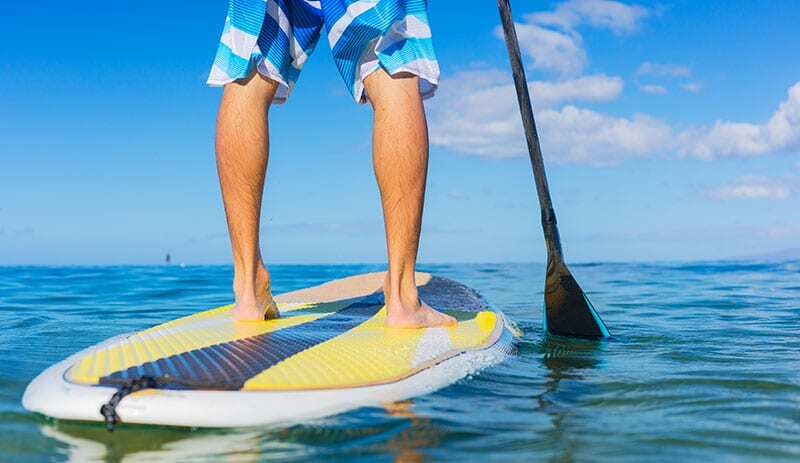 A suitable and fitting stand up paddle board will make your time in the water much more enjoyable, but what do you do with it when you’re not out on the water? 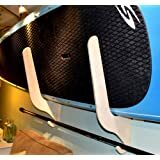 Let us give you some indoor paddle board storage ideas to ensure your SUP stays in good shape. Ceiling Mount Racks. This is often the most common and space saving form of storage for SUP. It saves you room on the walls and floor space. 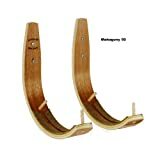 You can DIY this with a quick trip to Home Depot, or buy one of the great already made racks that you can get online. Wall Racks. This is often the most obvious means of storage for SUPs. A vertical rack simply requires space away from areas where there is a lot of movement. 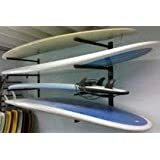 A typical vertical SUP rack can handle between four and five stand-up boards. The most obvious locations for wall racks are the walls and the garage. 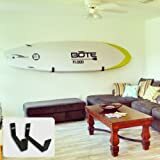 If you don’t want to drill holes in the wall to anchor the racks, you can simply procure a freestanding surfboard that leans onto the walls. Most of the wall rack models store between one and three SUPs with minimal use of floor or even wall space. Stand-Alone Racks/ DIY-Ing A Rack. Depending on where you procure them from, SUP racks can get expensive. They can also be easy to build on your own if you are a hands-on type of a person. 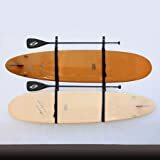 A simple DIY SUP rack requires little more than wood planks, PVC pipes, pipe insulation and some screws. You can also use eye bolt screws, carabiners, and ropes. There are lots of videos online that can guide you into making a DIY rack on your own. The whole DIY process could cost you $10-20 depending on the materials that you use. Build A Small Board Shed. Do you have a backyard? Even the smallest of backyards would be enough space to build a shed for your SUPs. A typical shed can accommodate eight dowels that vertically store four surfboards. It can also accommodate four shelves that store surfing accessories like wax, combs, leashes, and fins. If you’re the handy type, then you can build a boarding house. Alternatively, you can also choose from a variety of sheds at Home Depot, and Lowes. Building a shed or buying one means you have to spend a little more. Even then it allows you to pick the design and you can also use the shed for much more than storing the SUPs. Sun Damage. Your board is built to serve you in the water. This means it will always be exposed to the sun and weather every time you are out with it. The exposure to the sun can heat it up and weaken the materials. This is particularly prevalent in regions with hot and humid summers. The damage is often more noticeable on stand up paddle materials like the fiberglass epoxy skin. This process is known as delamination. When not in use, never leave your board exposed to direct sunlight for extended periods of time. And, don’t store it outside! Vent Plugs. Extreme elevation and temperatures are known to build up pressure within the foam of the core. Vent plugs are designed to allow air to escape freely from the core via the GORE-TEX seal built into the plug. The water-tight seal protects the board from delamination and water damage. Poorly fitted vent plugs will lead to water leaks. Therefore they should never be adjusted once installed tightly. Always check it periodically to ensure that it stays free from sand and debris that could block the venting. Dings & Water Damage. An extreme force on the outside shell of the paddleboard may cause pressure dents, cracks, and dings to occur. First, there can be pressure dents which resemble concave indentations on the external shell of the board due to knees, elbows or crashes. Secondly, there can be cracks and dings due to extreme blunt force. These have to be immediately attended to. Water damage adds weight to an SUP as water seeps into dings and unrepaired cracks. Some of the effects of water damage include discolouration, inefficiency, and lower buoyancy. In case of these damages always work with a fiberglass or epoxy specialist. Board Warranty. Just like most other products SUPs come with product warranties from the manufacturer. You have to make sure that your choice of storage does not invalidate your warranty. This covers both the issue of whether the board works for you and whether your storage will help it last for long. If the selling manufacturer specifies that the SUP needs a roomy bag, then use the board bag. However, most SUP board brands do not specify any required storage methods. You simply have to pick a reasonable storage that doesn’t invalidate the warranty. Materials Used. Some stand-up boards are made from carbon fiber, others made of wood, foam, or plastic. Each of these materials responds differently to different hazards. Knowing the board materials comes in handy when choosing a storage option. If one is affected by heat, then you have to ensure that the particular storage option has excellent air circulation. If water is the biggest issue, then you have to minimize contact with water or humidity. The other issue is the core materials used. Some are made from EPS foam, some have hollow core, others have polyurethane foam, and many are inflatables models. Available Space In Your Home. If you have a huge space at your home, you can simply choose any of the storage options. On the other hand, if you don’t have space then consider a space saving ceiling or wall rack or mount option. If you have only a few boards, then a ceiling rack would be great. 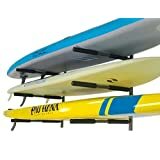 On the other hand, if you have more than three SUPs then a wall rack would be a far better option. Always weigh the availability of space then pick the one that will allow you maximization of space. Should Fins Be Removed Before Storing? Yes, definitely remove these before you do any long term storage of your paddle boards. At the end of the day, it’s critical to take into account the manufacturer’s storage instructions when purchasing the SUP board. 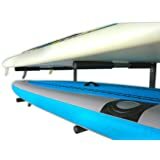 Proper SUP board storage is as much a function of its quality as it is about your own general safety and storage practices.